Thomas Hutchins (1730-1789) was a geographer, surveyor, frontiersman, engineer and army captain under the British forces. Refusing to fight American Revolutionaries, he was prosecuted for high treason, and upon release made his way to South Carolina. There he joined the Revolutionary forces and fought for American independence. His service garnered him the title of Geographer to the United States in 1781. He was the only person to ever hold this position. An Historical Narrative and Topographical Description of Louisiana and West Florida (1784) gives a base description of the coastline, river systems, and barrier islands of Louisiana and West Florida. Hutchins utilizes soundings and charts created by George Gauld, an engineer employed by the British Admiralty to survey the Gulf Coast. (Sections included here are the Preface, descriptions of the West Florida Panhandle and the Tortugas, the Conclusion, and a Table of Distances that closes the volume.) Hutchins provides a geographical description from the western boundary with present day Alabama to Apalachicola. He makes note of the soil, climate, and vegetation on land, as well as potential commodification of land based resources for economic use. The sea passage and keys/spits of the Tortugas are described for the purpose of navigation from Pensacola to and around the tip of the Floridas. Attention is given to the location of coral reefs and shallow waters where vessels could run aground. The information offers a glimpse into Florida during the time of Spanish possession. It is a useful resource to anyone seeking to learn the outlay of the Gulf Coast portion of this state during the mid to late eighteenth century. Hutchins died in 1789, while surveying the Seven Ranges of Ohio, where he was the first to employ the Public Land Survey System, the method used since to divide tracts and parcels across the United States. As a supporter of the early republic’s expansion, what later became called Manifest Destiny, his preface and conclusion offer insight into the mechanics of colonization. Gauld, George and John Lorimer. A General Description of the Sea Coasts, Harbours, Lakes, Rivers, etc. of the Province of West Florida 1769. Alexandria: VA, 1769. Print. Hutchins, Thomas. A Topographical Description of Virginia, Pennsylvania, Maryland, and North Carolina, Comprehending the Rivers Ohio, Kenhawa, Sioto, Cherokee, Wabash, Illinois, Missisippi, &c. The Climate, Soil and Produce, Whether Animal, Vegetable, Or Mineral; the Mountains, Creeks, Roads, Distances, Latitudes, &c. and of Every Part, Laid Down in the Annexed Map. Published by Thomas Hutchins, Captain in the 60th Regiment of Foot. with a Plan of the Rapids of the Ohio, a Plan of the several Villages in the Illinois Country, a Table of the Distances between Fort Pitt and the Mouth of the Ohio, all Engraved upon Copper. and an Appendix, Containing Mr. Patrick Kennedy’s Journal Up the Illinois River, and a Correct List of the Different Nations and Tribes of Indians, with the Number of Fighting Men, &c. London: J. Almon, 1778. Imlay, Gilbert. A Topographical Description of the Western Territory of North America. London, England, 1797. Hutchins, Thomas. An Historical Narrative and Topographical Description of Louisiana and West-Florida, comprehending the River Mississippi, with its principal branches and settlements, and the Rivers Pearl, Pascagoula, Mobille, Perdido, Escambia,Chata-Hatcha &c …. Philadelphia: Robert Aiken, 1784. Several years residence in the Province of West-Florida, during which I entered into a minute examination of its coasts, harbours, lakes, and rivers, having made me perfectly acquainted with their situation, bearings, soundings, and every particular requisite to be known by navigators, for their benefit I am induced to make my observations public. The expence and trouble at which this knowledge has been acquired, are far from inconsiderable; however, if the accurate surveys and descriptions I am thereby enabled to give, prove instructive and beneficial to my country, I shall esteem myself amply repaid. It may be proper to observe that I have had the assistance of the remarks and surveys, so far as relates to the mouths of the Mississippi and the coast and soundings of West-Florida, of the late ingenious Mr. George Gauld, a Gentleman who was employed by the Lords of the British Admiralty for the express purpose of making an accurate chart of the abovementioned places. 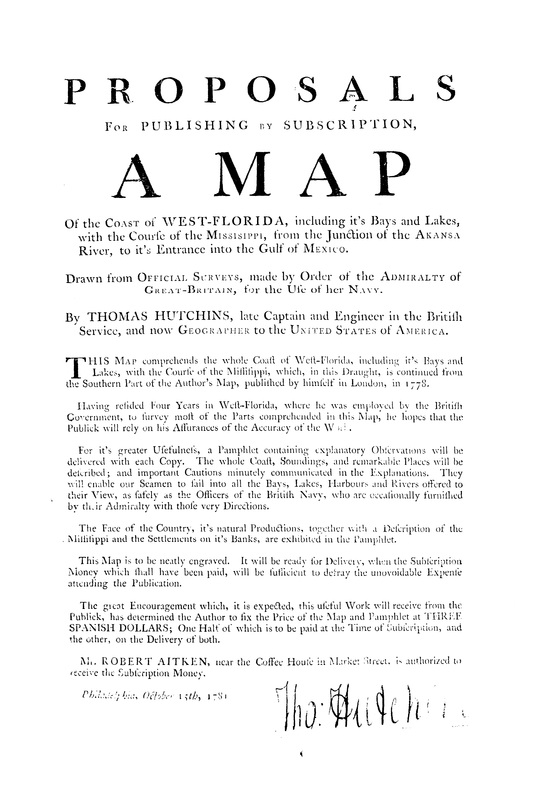 A particular detail of the advantages that may in time accrue to the possessors of West-Florida, with a complete description of the country and its productions, would not make an improper addition to the following work; but as the more immediate purpose of it is to point out the dangers of its coasts to the approaching mariner, I shall confine the cursory remarks I make on those heads, to such particulars only as are most deserving of notice. Before I enter on the prosecution of my design, I would just observe, that I shall be more solicitous to make the result of my investigations useful than amusing, I shall endeavor rather to be clear and intelligible that study to deliver myself in florid language. There is nothing remarkable between the river Perdido and the bar of Pensacola, except the grand lagoon, which reaches near to the Perdido, with some straggling trees on the peninsula, and the high red bank on the North side of the before mentioned. The soundings between the bars of Mobille and Pensacola are pretty regular, except near the bars, where there is deep water along shore, as the stretch out. It is necessary in nearing them, to keep a good offing till their respective marks are on for going over in the deepest channel. Immediately without them there is very deep water, from 7 to 12 and 13 fathoms, oozy bottom, and good holding ground. At the same distance from the shore between them, there is only six or eight fathoms; the bottom in general is fine white sand with black specks and broken shells: in some places a coarser bottom, and in others oozy sand. The West end of the Island of St. Rosa stretches athwart the mouth of the harbour, and defends it from the sea. it would be difficult to ascertain the entrance, were it not for a remarkable red cliff which not only distinguishes the place, but is a mark for going over the bar in the deepest water. The bar of Pensacola is of a semicircular form, with the convex side to the sea, and lies at a considerable distance from the land, occasioned, no doubt, by the conflict between the sea and the bay. The bar runs in a curve from the West breakers all the way to the eastward of the fort, or Signal house on Rose island, the outer end of it extending about a mile without breakers; it is a flat, hard sand, but the bottom on both sides is soft, oozy ground. After entering on the bar in the deepest channel, the old fort on Rose island bears NE 1-4 N two and a half miles, the middle or highest red cliff, N 1-2 W three and a half miles. In coming from the eastward or westward it is best to keep in six or seven fathoms, till the West declivity of the highest part of the red cliff bears about N 1-2 W; as above; and then to continue that direction. The water shoals gradually from four to three and three-fourths fathoms; on the shoalest part it is 21 feet, then it regularly deepens and the bottom grows softer. The latitude of the bar of Pensacola is 30d 22m North, and longitude 87d 40m West from London, the variation of the compass near 5d East. When over the bar in five or six fathoms, it is necessary to incline a little towards the western reef, which has deep water close to it, in order to avoid the 10 feet bank that there extends about half a mile SW from the point of Rose island. As the line of direction for the deepest water over the bar leads just over the West point of this bank, therefore it is proper to keep within one and a half or two cables length of the breakers (on the North end of which there are two dry sandy keys) till the West point of Rose island is open with the straggling trees to the southward of Deer Point, at the entrance of St. Rosa channel, when one must haul up to the eastward between them clear of the 10 feet bank. There is a narrow channel of 13 feet between this bank and the point of Rose island. There is also a shoal stretching a sweep from the red cliff towards the above mentioned sandy key, therefore care must be taken not to shut in Tartar Point with Deer Point; but as the soundings are regular, there is no fear, unless there be little wind, with the tide of ebb, which sets directly on this shoal, and in that case it is necessary to anchor in time. Within Tartar Point the bay is about five or six miles broad, stretching to the North-east towards the town; which is situated on the main land, about eight miles from Rose island. From thence the bay turns more to the east ward, and is divided into two large branches or arms; one of which continues to the eastward about 18 miles from Pensacola, and the other to the northward nearly the same distance, from three to five miles broad. Between Tartar Point and Pensacola there are two large lagoons, the southermost of which runs behind the red cliff. All the West side of the bay, which forms a sweep towards the town, is shoal for the upwards of half a mile off shore, but the soundings are regular to it. There is no danger in the bay between Pensacola and Rose island, except a shoal that runs from Deer Point, which ought to be attended to in working up or down the harbour. It is the more dangerous, as there is no warning given by the soundings; for from six fathoms, in a few casts of the lead, you have but as many feet. It runs more than half a mile to the westward from the point. The governor’s house in the fort bears from the extremity of it N 1-2 E three and a half miles, and English Point N N E 1-4 five miles. The best anchorage for large vessels is just a-breast of the town, in four fathoms, about one third of a mile off shore; taking care not to bring the governor’s house more to the westward than N W 1-4 W, on account of the shoal that runs off from Indian Point at the East end of the town. As the tides in that offing run nearly East and West, ships should be moored accordingly. The bay of Pensacola, was first discovered by Pamphilio de Narvaez in 1525. After him, several other Spanish adventurers visited it, who gave it different names; as Porta da Anchuse, Bahia de St. Maria, &c. But Pensacola was the proper name of it among the Indians, which it will henceforth probably retain. The first establishment the Spaniards made here was in 1696; when Don Andrea de Arrivola was appointed governor of this province, which then comprehended a very large tract of land, on the gulph of Mexico. He built a small stockado, which he called fort St. Charles, with a church, &c. just by the red cliff at the entrance of the harbour. This place was taken in the year 1719, by the French from Mobille. Pensacola fell at that time an easy prey, having only about 150 men to defend it. Shortly afterwards it was retaken by the Spaniards, who were again dispossessed by the French in the same year. The second time the French made themselves masters of it, they kept possession till the year 1722, when it was restored to the crown of Spain by treaty. The Spaniards in the interim removed to S.t Joseph’s bay. About the year 1726, they built a small town on the West side of Rose island, near the present fort, or signal house, which was originally constructed by them, but greatly improved by General Haldmand. The settlement remained there till about the year 1754; but being then partly overflowed in a gale of wind, the town was removed to the place where it now stands. After this county was ceded to the English by the peace of 1762, many places were pointed out as conveniently situated for the purpose of building a town; but on due examination, and the present town; but on due examination, the present situation was generally preferred, and the present town regularly laid out in the beginning of the year 1765. The town of Pensacola is of an oblong form, and lies almost parallel to the beach. It is about a mile in length, and a quarter of a mile in breadth, but contracts at both ends. At the West end is a fine rivulet, from which vessels are supplied with water. The present fort was built by the writer of this narrative in 1775, with cedar pickets, with 4 block houses at proper distances, which defend or flank the works. It takes up a large space of ground just in the middle of the town, which it divides in a manner into two separate towns, and can be of no great service towards the defence of the place, in case an attack be made on it, either by natives or a civilized enemy. The town of Pensacola is surrounded by two pretty large brooks of water, which take their rise under Gage hill, a small mount behind the town, and discharge themselves into the bay, one at each extremity of the town. The town and fort of Pensacola, surrendered to the arms of his Catholic Majesty, in the year 1781, and with them the whole province of West Florida became subject to the king of Spain, as before mentioned. The hopes of a Spanish trade induced many people to settle here, at a great expence, but it did not answer their expectation. The principal objects ought to be the Indian trade, indigo, cotton, rice, hemp, tobacco and lumber, these being the natural produce of the country. Tho’ Pensacola stands in a very sandy situation, yet with pains the gardens produce great plenty of vegetables. Fruit trees, such as orange, fig, and peach trees are here in perfection. And the bay abounds with a variety of fine fish. About a mile to the eastward of Pensacola, between it and the English point, is the East lagoon, which after turning to the NW 4 or 5 miles, receives the Six Mile Brook. This is a pretty little winding stream, on the East side of which is an iron mine, where a large natural magnet was found. There is a fine mineral spring of the Chalybeate kind [tasting of iron], near the mouth of the lagoon, of which there are several others in this country. From English point, the bay stretches to the northward. On the West side, near the mouth of the river Escambia, lies Campble Town, a settlement of French protestants, about 10 miles from Pensacola by land, and 13 by water. The spot on which it stands is high, and a very light soil; but its situation being near the marshes, it is thereby rendered unhealthy, and has been the means of carrying off many of the inhabitants who were sent out in 1766, and were for sometime supported by government, in order to manufacture silk; but either for want of proper management, or other reasons, nothing of that kind was attempted, and the place is since abandoned and the town destroyed. The river Escambia, the most considerable that falls into the bay of Pensacola, empties itself near the head of the North branch, about 12 or 15 miles from Pensacola, through several marshes, and channels, which have a number of islands between them, that are overflowed when the water is high. There is a shoal near the entrance, and vessels that draw more than 5 or 6 feet cannot be carried into it, even through the deepest channel; but there is from 2 to 4 fathoms afterwards. I ascended it with a boat upwards of 80 miles, where from the depth of water it appeared to be navigable for pettiaugers many miles further. It is uncertain where the source of this river is; but supposed to be at a considerable distance, and is very winding in its course. The lands in general on each side of the river, are rich low or swamp, admirably adapted for the culture of rice or corn, as may suit the planter best; and what gives these low lands a superiority over many others, is the great number of rivulets that fall into this river from the high circumjacent country, which may easily be led over any part of, or almost all the rice lands, at any season of the year whatever. Near the mouth of this river are a great number of islands, some of very considerable extent, and not inferior for rice to any in America. The settlements made by Messieurs Tait and Mitchell, Captain Johnson, Mr. M’Kinnon and some others, are very evident proofs of this assertion, who, in the course of two years from their first settlement, had nearly cleared all the expences they had been at in making very considerable establishments; and I am well assured would entirely have done it in another year, had not the Spaniards taken possession of the country. Further up the river, we meet the other islands, having much higher banks than those below, very fit for raising Indian corn, or pulse of all kinds, with a sufficient proportion of rice land on them also. The large island on which Mr. Marshall made his settlement, nearly opposite the old stockaded fort, about 28 miles from Pensacola by land and 40 by water, is the uppermost island of any note in the river Escambia, and is, without doubt, in point of fertility of soil, equal to any thing to be met with in the country. The westerly part of this last mentioned island is high, and not subject to be overflown, unless in remarkable high frothes, and then only some particular low parts of it, the rest is high and well secured against floods; the eastern part of it is low and liable to be overflowed at some times of the year; the high lands extends from about a mile, to a mile and a half from the westermost branch of the river that surrounds it, and is equal to any of the Mississippi, Amit, or Comit. A more advantageous place for small settlements than this, is not to be met with any where near Pensacola. The country on each side of the river above this island is higher, and as the water is confined in one channel, forms a most beautiful river, with great plenty of good low lands on each side of it for many miles up. The low lands generally extend from a mile and a half to two miles from the banks of the river, and some places more, when we come to a fine high pine country, intermixed with oak and hickory land. There are, on both sides of this river, a number of rising grounds or bluffs, which afford delightful prospects on the river, and would be elegant situations for gentlemens seats. The low lands and islands abound with great quantities of white and red oak for staves, which answer well for the West-India market, and an inexhaustible quantity of cypress for lumber and shingles, together with plenty of red and white cedar for building. The open country, or high lands bordering on these low rich lands are generally pine, but of a quality superior to most other pine countries, having generally a good soil for five or six inches deep, and well adapted for raising corn, beans, peas, turnips, potatoes, &c.
Perhaps there is no country more beautifully diversified with hills and dales, nor more plentifully supplied with fine streams, than that which borders on the low lands upon this river. But what, in a very particular manner, recommends this part of West-Florida, is the fine and extensive ranges for cattle which are so frequently to be met with here; it being very common for an ordinary planter to have 200 heads and some 1000 heads, within the vicinity of Pensacola. There is scarcely a stream in these parts but what has water sufficient for saw-mills, and the country abounds with excellent timber for planks or lumber of all kinds. The air is pure and healthy, and the planters and negroes enjoy a good state of health the year round. The Indians emphatically call it, on account of the fine streams of water every where to be met with, the sweet water country. Great plenty of fish is to be found in this river, and all kinds of wild game are to be met with in great abundance. With regard to the face of the country between the Escambia and Pensacola, it is varied with vallies and rising grounds. At about 20 miles from Pensacola the soil grows better than it is at the town; the vallies are covered with grass or canes, interspersed with thickets of laurel, myrtle, and casina. There is generally a rivulet running through each of them, either towards the Perdido or Escambia. The rising grounds are chiefly covered with pines, oak, and hickory. The North branch of the bay of Pensacola is only navigable for small vessels. It was formerly well settled on each side. The middle land between the North bay and the Ouyavalana, or Yellow Water, a branch of the East bay, abounds with large tall pines fit for masts, yards, &c.
The Yellow Water, or Middle river enters the East branch of the bay at the N E corner, and after going about five or six leagues up the country, the eastern branch ends in a bason or lake at the bottom of a rising ground, but the western branch I have ascended some leagues further. There are several small islands near the entrance of this river, which produce cypress and small cedars, but the soil is indifferent. The East river empties into the bottom of the East branch, about six miles from the Middle river. It is about a quarter of a mile for 2 leagues, and then contracts to the breadth of 30 or 40 feet. This river comes from the eastward, running nearly parallel to St. Roses channel, and its source is about 16 miles from its entrance into the bay. The peninsula between the bay of Pensacola and St. Roses channel, which is from 1 to 3 or 4 miles broad, is in general very poor sandy soil. It produces, in some places, large pines and live oak. Rose island extends along the coast, for the space of near 50 miles, and is no where above half a mile broad. It is very remarkable for its white sandy hummocks, and straggling trees here and there. There is a clump of 4 tall trees close together, which, at a distance, appears like one, about 18 miles from the West end, and another of the same kind about a league further to the eastward. There are likewise several hummocks, more easy to remark than describe, but an attentive person, after once or twice sailing along, can be at no loss to know what part of the coast he falls in with. The peculiarity of the appearance of Rose island from the sea, and the deep soundings all along it, are of great service to know the coast: there are 9 or 10 fathoms in some places, within a mile or two of the shore; and, when the frigate is within 16 or 17 fathoms, the tops of the trees on the main land may be descried from the quarter deck. The bottom is generally fine white sand, with broken shells, and black specks, but in one place off the East end of Rose island, out of sight of land, the bottom is of a coarse gravel, mixed with coral. This ought particularly to be attended to, as it is the only spot with that kind of soundings on the coast: it is of a considerable extent, and there are from 20 to 30 and 40 fathoms on it, or more. There is indeed a coral bottom off the bay of Esperito Sancto, and some other parts on the coast of East Florida, but these generally begin in 7 or 8 fathoms, within sight of land; from which and the difference of latitude, one cannot be mistaken for the other. This is a very extensive bay, stretching about 30 miles to the north-east, and is from 4 to 6 miles broad. There is a bar before it with only 7 or 8 feet where deepest. But afterwards there is 16 or 17 feet, as far as the red bluff on the main land. The channel between this bluff and the East part of Rose island is but narrow, and a little further on, towards the bay, it is choaked up with a large shoal in some places dry, the deepest water on it is only 4 or 5 feet; so that nothing but very small vessels can enter this bay from the sea, and the channel between Rose island and the main, is just sufficient for boats or pettiaugers. On the North side of St. Rose’s bay, almost opposite to the entrance from the sea, there are three pretty large branches, which stretch several miles: the westermost, which is the largest, is again subdivided into smaller branches, all which have deep water. The other two receive each a considerable rivulet of clear water with a rapid stream. On the banks there is plenty of cedar, &c.
The largest river that falls into St. Rose’s bay is the Chacta-hatcha or Pea river, which runs from the N E, and enters the bottom of the bay through several mouths, but so shoal that only a small boat or canoe can pass them. I ascended this river about 25 leagues, where there is settled a small party of the Coussac Indians. The banks of this river, in point of soil and timber, resembles very much those of the river Escambia. Between the bays of St. Rosa, and St. Andrews, the coast runs E S E, and S E by E, for the space of 52 miles, the soundings much the same as off Rose island; it is to be observed that the trees are thick, and come pretty close to the shore. There are likewise some red hummocks as well as white, which with the trenching of the land may be of service to know that part of the coast. The entrance of St. Andrew’s bay is between a small island on the right hand, and a narrow peninsula on the left. There is a high white sand hill, which is a remarkable object from the sea: it lies in latitude 30 d 06 m North, and about 10 leagues to the North-west of Cape Blaise. From the point of the peninsula, there is a large shoal extending for more than two thirds of the way towards the island; which is 2 miles distant, leaving a channel of 17 or 18 feet, but it has a small bar of 13 feet. There is anchorage just within St. Andrew’s island in 3 fathoms and an half, but it is more commodious within the point of the peninsula in 5 fathoms, with the advantage of fresh water, which is easily got by digging. St. Andrew’s bay runs first to the N W, nearly parallel to the sea shore, for 3 leagues; then it turns to the eastward for about a league, when a large branch breaks off to the S E. The main body continues to the northward for 2 leagues, when it is divided into two large branches, one going to the N E, and the other to the westward. This last, which is the least, reaches within a few miles of St. Rosa’s bay. The country between them is low and marshy, and full of fresh water ponds. St. Andrew’s bay is navigable for any vessels that can go over the bar. There is a large shoal with only 3 or 4 feet, about half way up the first reach, but there is a deep channel on the West side of it, and afterwards there is from 3 to 7 fathoms all over the bay. There are no rivers of any consequence, nor can the soil immediately on the bay be much commended; there is however great plenty of large pines, live oak, and cedar. From St. Andrew’s island to the bay of St. Joseph’s, the middle of the coast between them runs about E S E near 15 miles, with a shoal all the way between [end page 84] them near the shore, which easily appears, it being of a whiteish colour. There is from 12 to 18 feet on the greatest part of it, except towards the mouth of St. Joseph’s bay, where there is a bank near the middle, between St. Joseph’s point and the main land, with only 7 or 8 feet, and 4 fathoms just within; but there is a very good channel with 3 fathoms on the bar, between that bank and St. Joseph’s point, on the right hand going in. In going into St. Joseph’s bay it is requisite to keep within a cable and a half or two cables length of the peninsula, in five or four and a half fathoms, as it shoals regularly towards the point, from which a spit of sand runs out a little way; and when in three fathoms to haul round gradually, still keeping near two cables length off shore. The bar is narrow, and immediately within it there if from four to six and a half fathoms soft ground. The end of the peninsula forms two or three points, from each of which a small spit runs off for a little distance, which may be known by the discoloured water on them. This is an excellent harbour; in which the best place for anchoring is just within the peninsula, opposite to some ruins that still remain of the village of St. Joseph. There the Spaniards had a post, which they abandoned about the year 1700, but they took possession of it again in 1719. There is very good water to be got here by digging, and on the North side of the bay are two or three small fresh water brooks, opposite to which are three or four fathoms close to the shore. In the year 1717, the French erected a fort which they called Crœvcœur, a mile to the northward of a brook in St. Joseph’s bay, opposite to the point of the peninsula, but abandoned it the next year, on the representation of the governor of Pensacola that it belonged to his Catholic Majesty. The bay is nearly of the figure of the horse-shoe, being about twelve miles in length, and seven across where broadest. Towards the bottom of it are a few small islands, and the water is so shoal that a boat can hardly go near the shore. The soil on the North side of the bay is very sandy, but there are some spots near the ruins of St. Joseph’s that are covered with a kind of verdure, and produce plenty of grapes, some of which are large, of a purple colour, and pretty good to the taste: they were probably planted there by the Spaniards. There are here likewise some small cabbage trees, of which there are great numbers on St. George’s islands beyond Cape Blaise, and on all the coast to the eastward. These cabbage trees do not grow above the height of 20 feet; the bud, or unformed leaves in the heart being boiled has somewhat the taste of cabbage, but is more delicious. A very good establishment might be made here for a fishery, as the settlers might make salt on the spot to cure the bass, rock, cod, grouper, red mullet, and other kinds of fish, which are here in great abundance; and, when well cured, are little if at all inferior to the those brought from the northward. The peninsula between St. Joseph’s and Cape Blaise is a narrow slip of land, in some places not above a quarter of a mile broad. The gaps here and there upon it, and the water in the bay appearing through them from the mast-head, together with the trenching of the land about NNW, and SSE, for near four leagues, make it easily known. The trees about Cape Blaise are very thick, and there is a remarkable single tree, like a bush, that stands without the others towards the point. In the case of an easterly wind, there is safe anchorage opposite the thickest of trees in six or seven fathoms, about one or two miles off shore; and there is a large pond of fresh water near the beach, about three or four miles to the eastward of Cape Blaise. There is also a remarkable gap among the trees between the sea and the bottom of St. Joseph’s bay, where is a narrow isthmus not above 5 or 600 yards broad. Cape Blaise, where it ends in a low point near two miles from the trees, in latitude 29d 40m N, is not only remarkable from the aforesaid circumstances, but likewise on account of the irregular soundings that are found a great way out at sea from it. There is a spit of land that runs about two miles from the point in a SSE direction; and there are several banks of three or four fathoms, at the distance of six or seven miles, with deep water from seven to ten fathoms between them. There are even some banks of five and six fathoms almost out of sight of land from the mast-head; but though they may alarm a stranger, there is no danger in going near enough to make the land plain. There is another cape or point of land about six leagues to the eastward of Cape Blaise, being an elbow of the largest of St. George’s islands, nearly opposite to the river Apalachicola. This point lies in 29d 38m N. There is a large shoal running out from it a considerable way, but how far has not yet been ascertained. The coast between it and Cape Blaise forms a kind of hollow bay, with deep soundings and a soft bottom. There are two islands to the North-west of St. George’s cape; that nearest to it is small, and remarkable for a clump of straggling trees on the middle of it; the other is a pretty large island of a triangular form, and reaches within three leagues of Cape Blaise, having a passage at each end of it for small craft into the bay, between these islands and the river Apalachicola: but this bay is full of shoals and oyster banks, and not above two or three feet water at most in any of the branches of that river. Having thus given an account of the sea-coast of West-Florida, I shall conclude with a few general observations on the seasons, winds, tides, &c. As most of the bars lie a considerable way without the entrance of the bays and rivers, the water seldom rises or falls on them above a foot; but in the bays or channels it rises two or three feet. The tides are irregular, and seem to be governed in a great measure by the winds; but not always by that wind which blows directly on the spot. Though there is generally about 12 hours flood and 12 hours ebb, yet it often happens that there are two tides of each in the space of 24 hours; and sometimes the tide will run one way for the space of 18 hours together, and only five or six hours the contrary, so that nothing can be said with certainty on this subject. By reason of the trade winds blowing in the Atlantic ocean, and continuing into the bay of Mexico, it is natural to suppose that the water, being there hemmed in, will of course force a passage out where it finds the least resistance; which is through the gulph of Florida. From this general principle it should follow that on the coast of West-Florida it out to run from West to East, which in some measure would account for the shoals being found at the East end of all the islands on this coast, and deep water on the West ends; but in a large bay or Mediterranean sea like that of Mexico, where there are so many rivers, bays, &c. the general course of the current must be greatly disturbed. From this proceeds that irregularity which is observable on the north side of the bay of Mexico, where the tide of ebb always sets to the eastward near the shore, and the flood from the southward or S E: what it may do in the offing has not yet been examined, nor will it be easily determined. To the eastward of Cape Blaise, the general observations concerning the deep water of the West end of [end page 88] the islands and peninsulas, and vice versa, do not seem always to hold good. Indeed, as far as has been examined of the West part of East -Florida, it is a shoal a considerable way from land, (and therefore ought to be known only to be avoided) except the bay of Esperitu Sancto, at the entrance of which, in the latitude 27d 8m, there is four fathoms and save anchorage. From the winds that prevail in general on this coast during the months of April, May, and to the middle of June, the weather is mild. The sea and land breezes are pretty regular and they generally continue so all the summer. In July, August, and most of September, there are frequent squalls, with much rain, thunder, and lightning; and sometimes gales of wind from the South and South-west for several days together. From the middle of October to the end of March, the northerly winds prevail, which at times blow very hard during the season; when the wind changes to the eastward or southward of that point, it is commonly attended with close, hazy, or foggy weather. It ought to be observed in failing in the Gulph of Mexico, to be very careful of logs or driftwood in the night time; for when the waters of the Mississippi are high, that river disgorges an immense number of large logs, or trees, which being driven by the winds and currents all over the gulph, may do considerable damage to the vessels under full sail [end page 89]. I shall here subjoin some Remarks on the Tortugas, &c. as heretofore published by George Gauld, Esquire. 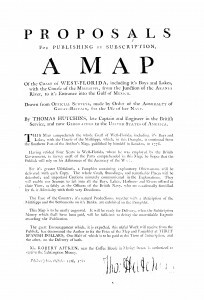 As a competent knowledge of the situation of the Dry Tortugas is absolutely necessary for the navigation to and from the North side of the bay of Mexico, and from the West-Indies through the Gulph of Florida, a few general remarks concerning them may not be unacceptable to the public at this time. They consist of ten small islands, or keys, extending ENE and WSW for ten or eleven miles, at the distance of about thirty leagues from the nearest part of the coast of Florida, forty from the island of Cuba; and fourteen leagues from the westernmost of the Florida keys. They are all very low, but some of them covered with mangrove bushes, and may be seen at four leagues distance. The southwestermost keys, which, in going from Pensacola, Mobille, or the, is the corner to be turned, and coming from Cape Antonio the point to be avoided, lies in 24d 32m North latitude, and about 8d 50m West longitude, from the Royal Observatory at Greenwich; the variation of the compass, by a medium of several observations, is seven degrees East. A reef of coral rocks runs about a quarter of a mile SW from these keys, the water on which is discoloured; and in general, wherever there is danger it may easily be seen from the mast-head in the day time. There is a large bank of brown coral rocks, intermixed with white patches of sand, about five of six miles to the westward of the Tortugas, with very irregular soundings from six to twelve fathoms; the bottom appears very plainly, and though it may be alarming to strangers, yet there is no danger. You will find from thirteen to seventeen fathoms between this bank and the Tortugas. If you are bound to the eastward, and meet with a strong easterly gale, which is frequent there in the summer season, you may safely come to an anchor in five or six fathoms, under the lee of the long sandy island to the northward of the SW key, about a quarter of a mile offshore. The bank of soundings extends only about five or six leagues to the southward of the Tortugas, but much farther to the westward, and all the way to the northward along the Florida shore. This is a lucky circumstance for the safety of navigation in those parts, as caution in soundings may prevent any danger in the night time; for the soundings are extremely regular all along this bank to the northward, almost to Cape Blaise, in latitude 29d 41m: so that by the latitude and depth of water, we generally know how far we are to the eastward or westward. There is a space of several leagues together, from twenty to fifty fathoms, but from fifty or sixty it deepens fast to seventy, eighty, and soon after no ground. From the bar of Pensacola to the Dry Tortugas the true course is S 30d E 134 leagues, and therefore SE by S by the compass will carry you clear of them to the westward; but it will be both prudent and necessary to sound frequently when you get into the latitude of 26d and 25m, and never stand in to less than thirty fathoms in the night time, till you are past the latitude of 24d 30m, when you may haul up SE by E or ESE, which will carry you near to the Havana. There is a broad channel over the bank to the eastward of the Tortugas, of ten to seventeen fathoms, which, in going to and from the coast of West-Florida, &c might occasionally cut off a great deal of the distance; but that passage is by no means to be attempted, unless you can see the Tortugas distinctly, and keep within two or three leagues of the easternmost of them, as there is a coral bank of only twelve feet at the distance of five leagues, and farther on towards Cayo Marques, the westernmost of the Florida keys, there is a very dangerous and extensive bank of quicksand, on many parts of which there are no more than four or five feet of water. It is of a remarkable white colour, and may be easily seen and avoided in the day time. Having now finished my intended narrative, I shall close it with the following observations upon the probable consequences that will arise to the United States of America, from the possession of so extensive a country, abounding with such a variety of climate, soil, and productions; referring my reader for his further information upon the subject, to the Philosophical Essays published in London in 1772, concerning the state of the British empire on this continent. There is some amusement at least in reflecting upon the vast consequences, which some-time or other must infallibly attend the settling of America. If we consider the progress of the empires which have hitherto existed in the world, we shall find the short duration of their most glorious periods, owing to causes which will not operate against that of North America. Those empires were formed by conquest; a great many nations different in character, language and ideas, we by force jumbled into one heterogeneous power: it is most surprising that such different parts should hold together so long. But when the band of union was weakened, they returned to their original and natural separation: language and national character formed many sovereignties out of the former connected varieties. This, however, will be very different with North America. The habitable parts of which, including the dominions of Britain and of Spain, North of latitude 30d, contain above 3,500,000 square miles. It would be unnecessary to remark, that this includes what at present does not belong to our North America. If we want it, I warrant it will soon be ours. This extent of territory is much greater than that of any empire that ever existed, as will appear by the following table. The Russian empire, including all Tartary, is large than any of these. But I might as well throw into the American scale the countries about the Hudson’s bay, for the one is as likely to be peopled as the other; whereas all I have taken in will assuredly be so. Besides, North-America is actually peopling very fast, which is far enough from being the case with the Russian deserts. Now the habitable part of what was once the British dominions alone in North-America, contains above 1,200,000 square miles, or almost equal to any of the above. But the whole, as I before observed, is 3,500,000, or more than the Persian and Roman empires together. In respect, therefore, to extent, and the means of maintaining numbers of people, it is superior to all. But then comes the advantage which is decisive of it duration. This immense continent will be peopled by persons whose language and national character must be the same. Foreigners who may resort to us, will be confounded by the general population, and the whole people, physically speaking, one: so that those seeds of decay, sown in the very foundation of the ancient empires, will have no existence here. Further, the peopling of this vast tract from a nation renowned in trade, navigation and naval power, has occasioned all the ideas of the original to be transplanted into the copy. And these advantages having been so long enjoyed, with the amazing and unparalleled situation for commerce between Europe, Asia, and the great southern continent; and America at the same time possessing, above other countries, the means of building, sitting out, and maintaining a great navy; the inhabitants of this potent empire, so far from being in the least danger from the attacks of any other quarter of the globe, will have it in their power to engross the whole commerce of it, and to reign, not only lords of America, but to possess, in the utmost security, the dominion of sea throughout the world, which their ancestors enjoyed before them. None of the ancient empires, therefore, which fell a prey to the Tartars, nor the present one of China, can be compared to this of North-America, which, as surely as the land is now being, will hereafter be trod by the first people the world ever knew. This entry was posted in Uncategorized by Tom Hallock. Bookmark the permalink.